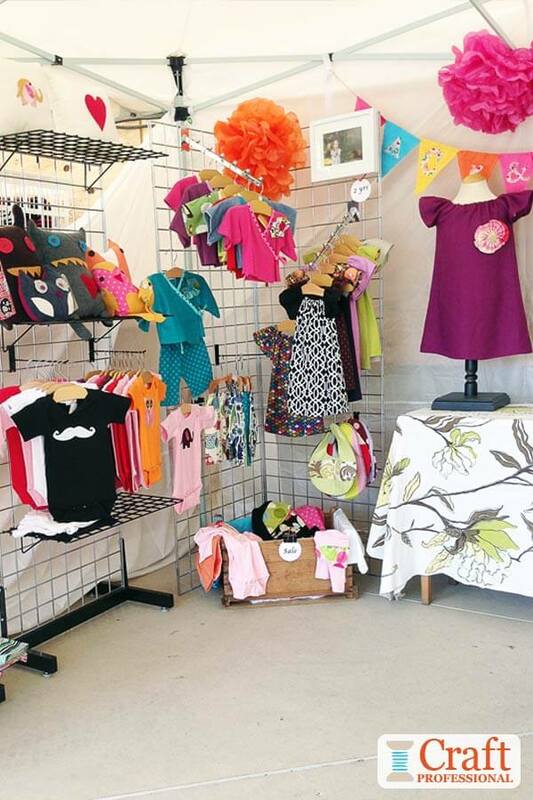 8 Handmade children's clothing booths with Charming and Affordable display options. 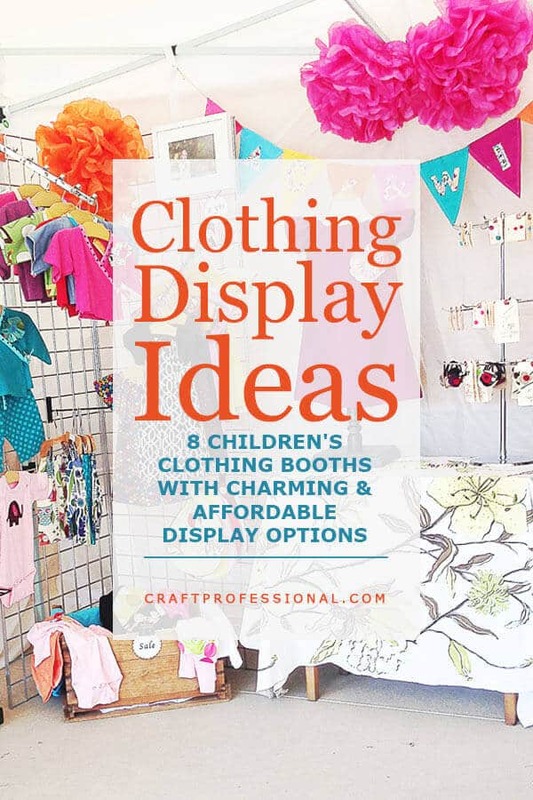 You've committed to doing a craft show or two, and now you're on the lookout for clothing display ideas. You need something portable, affordable, and, above all, something that will make your handmade clothes look adorable. The 8 photos below have all of that, and more! The two booths pictured below have plenty of smart display ideas. At first glance, all you really notice in both displays is the clothing. That's the effect you're looking for. 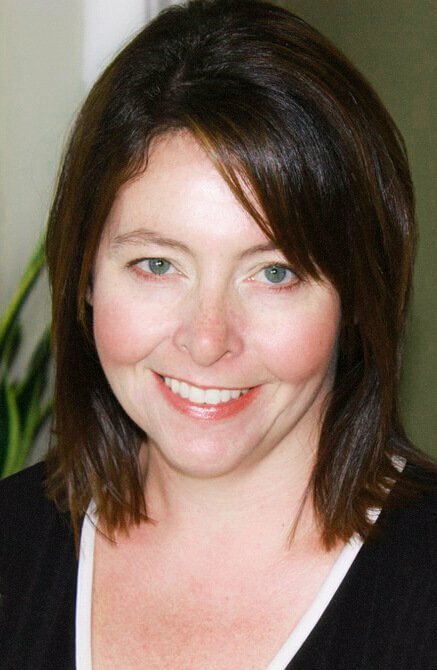 You want your product to take center stage. Look more carefully at the booths, though, and you'll find several elements that go into these fabulous displays. First, notice the overall lightness of the booths, including light walls, floor coverings, and display furniture. These element come together to create a neutral backdrop that makes the clothing stand out. Both displays use waterfall style display hooks. 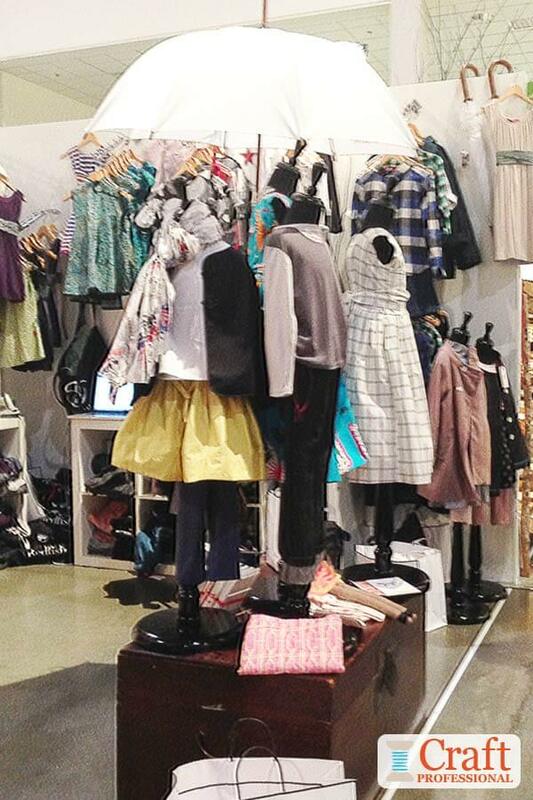 This type of clothing display makes your items face forward, so styles are easy to see at a glance. The booth on the left makes clever use of large-scale posters. You can see one in the upper left corner. Posters like these help draw attention from a distance. In the photo on the right, the white umbrella and vintage trunk with child mannequins make a sweet vignette. The trunk would be perfect for storage and transporting items, and the umbrella is a clever, inexpensive, and very portable item that adds a bit of whimsy to the display. Next we have two collections of adorable dresses. The display on the left uses the familiar combination of white walls and neutral display furniture, along with a light wood-look floor. It's a popular look for craft displays because it works. It gives you a bright, modern, neutral backdrop on which you can display almost anything to great effect. The display on the right gets creative with booth decor. The splash of blue fabric, tulle, and ivy adds to the fun character of the booth. Notice the most eye-catching dresses are featured and paired with matching hats to finish the look. Booth booths have plenty of lighting which is unobtrusive, but effective. 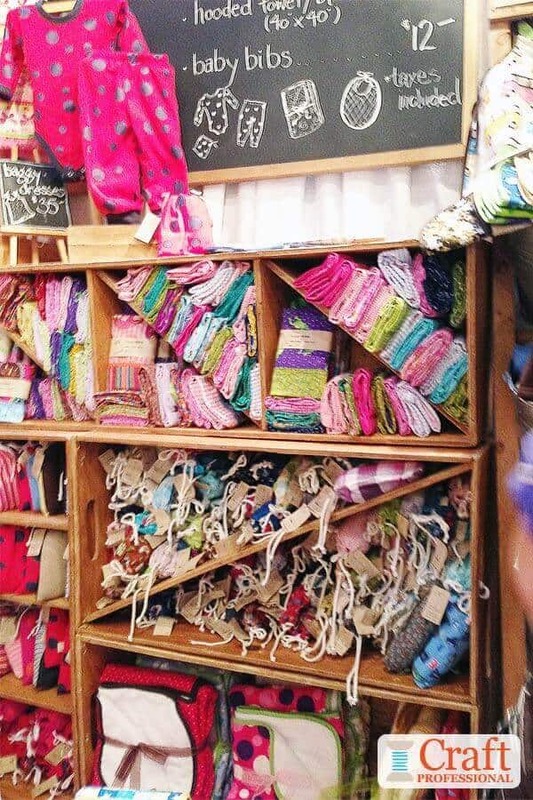 Here are a couple of quirkier clothing display ideas. 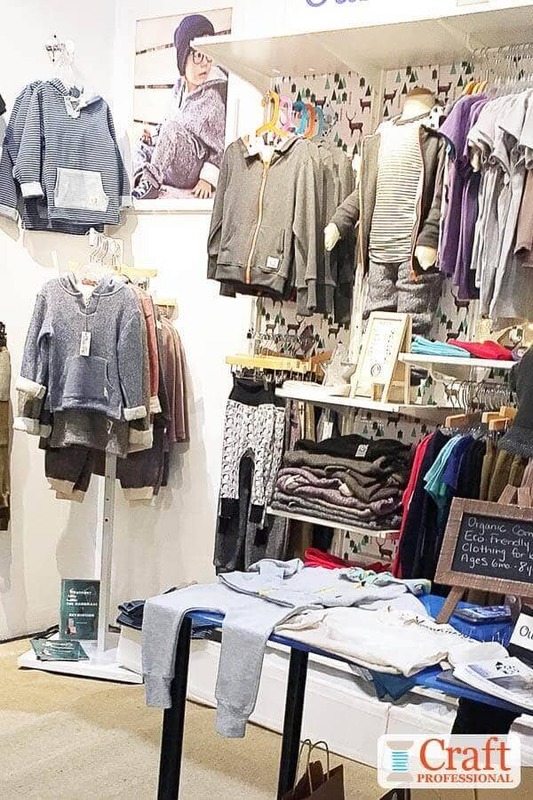 The casual display in wood crates on the left suits the casual pajamas. Of course, crates also function well for storage and transportation. The chalkboard adds interest to the booth and it's a fun and flexible way to convey information. The booth on the right is another great example of letting your work speak for itself. Clothing is displayed on a simple clothesline, and on wooden coat hangers hung from pegs. 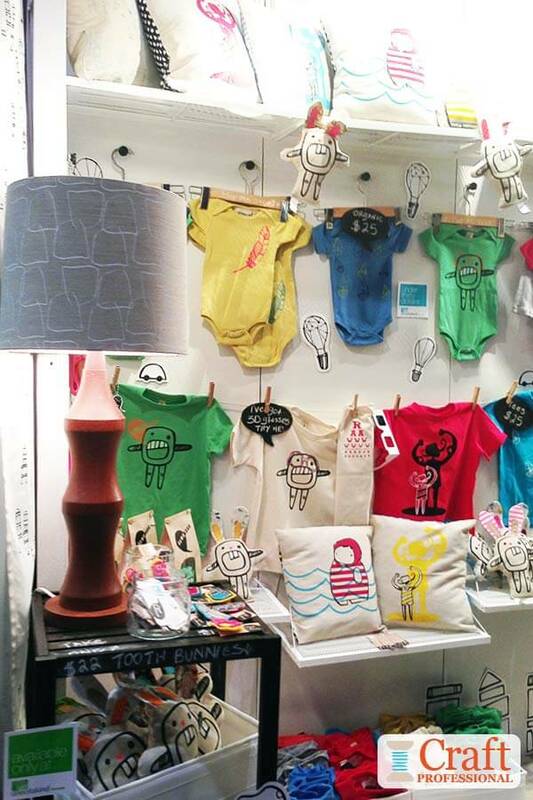 The retro lamp on the left is a fun way to add lighting to the booth. I completely adore this next display! Below, you'll see two sides of the same booth. The bones of the display are made of light walls and flooring, a few free-standing grid wall panels, shelves, and waterfall racks, along with a couple of folding tables and a mannequin to highlight a favorite dress. The most eye-catching elements of the display are simple, inexpensive DIY projects that anyone with a bit of creative flair could put together. A few giant tissue paper flowers suspended from the ceiling cost very little to make, and can be put together in an evening. The matching bunting looks like it's a no-sew project made from felt. The metallic lettering on the bunting is fantastic. 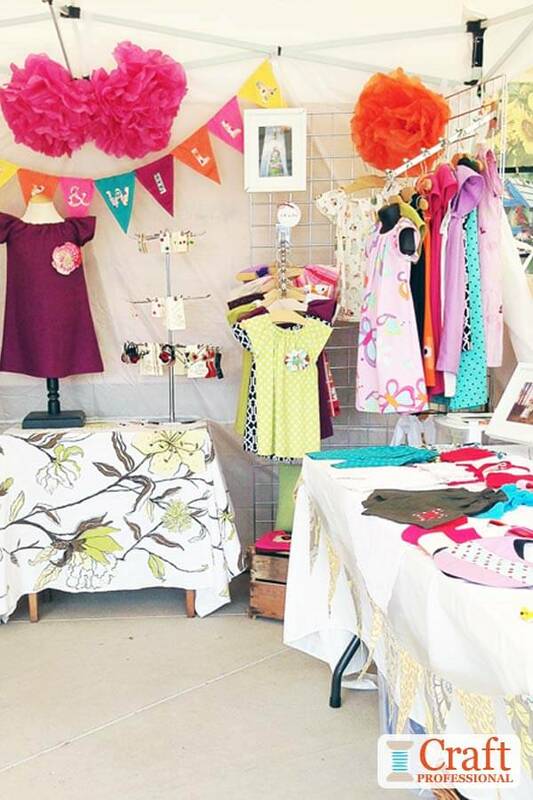 White walls with portable wood-look flooring create an effective and flexible backdrop for all kinds of craft booths. 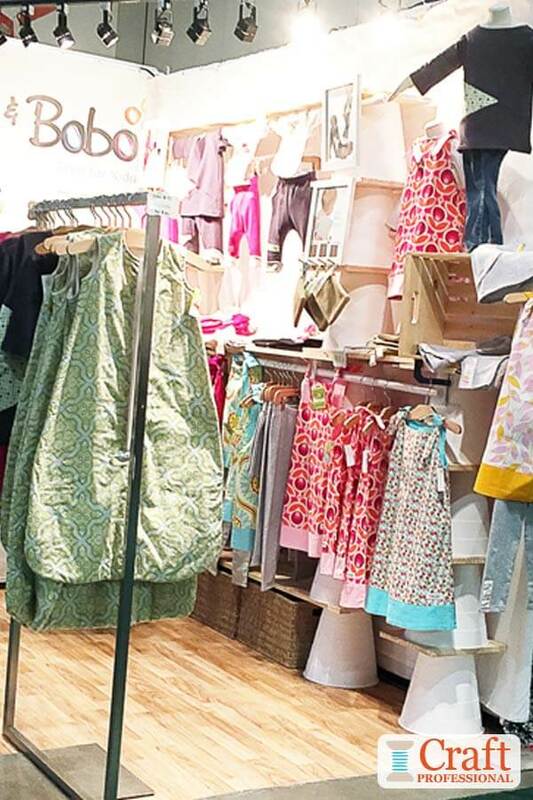 Free-standing grid walls, clothing racks, and waterfall-style racks are popular and smart ways to display clothing. Remember to fill your booth with light. 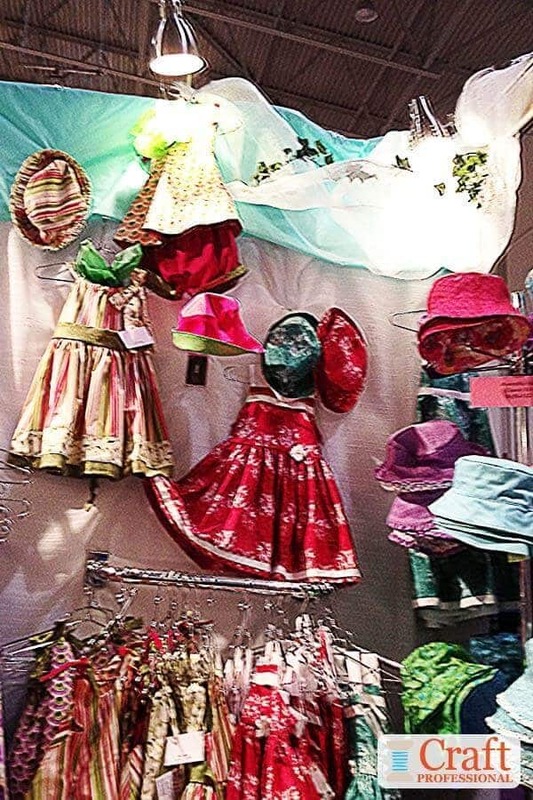 An inexpensive little touch of fun - a white umbrella, some fabric and tulle, a chalkboard, paper flowers, or bunting - can add extra interest and charm to your booth.